“The Rewrite” marks the first time that Hugh Grant has done a comedy film since the 2009 box office bomb “Did You Hear about the Morgans?”, a film that I had no interested in seeing. Fast forward to 2015, where he’s back doing what he does best in the comedy “The Rewrite”. The film is about an award winning screenwriter Keith Michaels (Grant) who has had a string of unsuccessful films. When he can’t find work, his agent lines him with a job teaching as a screenwriting professor at an Upstate New York college. There, he hopes to focus more on his new screenplay instead of teaching his students on the essences of screenplay writing. But somehow, Michaels starts to take an interest in his job and the students that he teaches. Marisa Tomei, Bella Heathcote, J.K. Simmons, Chris Elliot and Allison Janney costars in this film. Going into this film, I was hoping this would not be like the two Hugh Grant films that I saw. Thankfully that wasn’t the case, as I really liked this film. 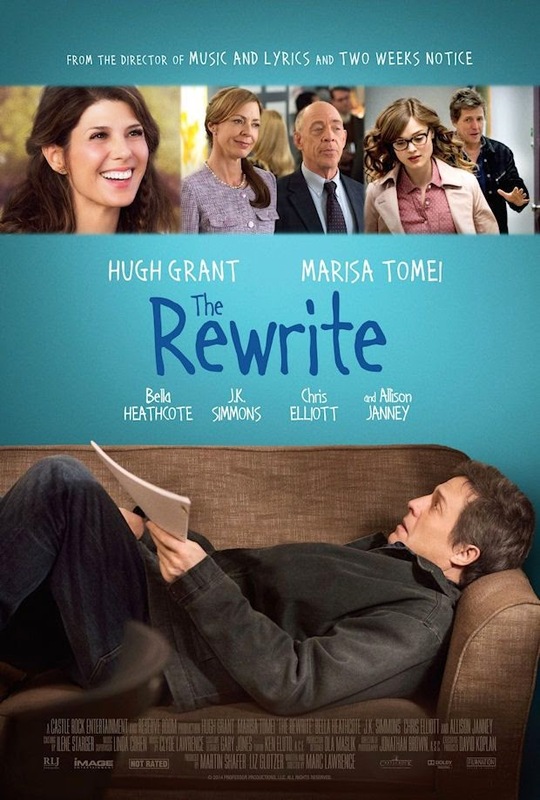 “The Rewrite” is an entertaining film that is return to form for Hugh Grant. Most of that had to do with the direction from Marc Lawrence, who ironically enough directed Grant in “Two Week’s Notice” and “Music and Lyrics”. One of things that makes his direction good was the fact that he manages keep the flow of the film at a witty and entertaining pace. Whether it’s the way that he approaches the scenes to how gets everything that he needs to make everything work, there was never a point where I was bored with the film. The other thing that Lawrence does well is to make sure that the performances keep you interested in the story. He makes sure that his cast makes their characters are interesting through their character’s personality and having chemistry with each other to make the scenes entertaining. This made the film entertaining especially with Hugh Grant’s and Marisa Tomei’s characters. Speaking of those two, both Hugh Grant and Marisa Tomei were very good here. It was a return to form for each of them as I’ve always liked Grant in films like “Four Weddings and a Funeral” and “Love Actually” and Tomei in “My Cousin Vinny” and “The Paper”. They both did a great job with the way that they handled their scenes together, as chemistry was very good and made their scenes together stand out. The film also has a very solid screenplay from director Marc Lawrence, whose screenplays for Hugh Grant’s last two collaborations weren’t that impressive as it hurt those films. One of things that makes his screenplay good was the fact that it develops the main character during the course of the film. Lawrence does a good job making sure that the character goes through changes and how it affects him. It helped made the main character interesting and made the story entertaining. The other thing that I liked about it was the film’s humor. He does a very job in making the humor work so well without getting carried away. It’s very witty and a change of pace from the comedies that are currently are being made today. Sadly, there isn’t many extras on the disc. The extras start over with a seven minute featurette with some of the cast and crew talking about their characters and story of the film. It’s an okay featurette that felt basic for the most part. After that, the disc warps up with deleted scenes and trailer. This was a surprising return to form for Hugh Grant, as he’s very good in this film. “The Rewrite” is an entertaining and funny comedy that doesn’t need a rewrite.